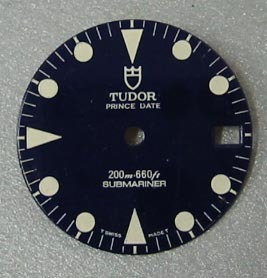 This is the Dial only as shown - it is a genuine Tudor Sub dial - it has some shopworn marks on the matte dial that may not show in this photo and are covered easily by black marker if need be. There are no scratches gouges or missing black - it is as shown. This is NOS = New Old Stock, fresh from the vault of a jeweler in Switzerland never sold and never worn or used. This is about 16.3 mm with the original feet --- Please refer to item Tudor - the cost is 48.00 + shipping.